What happens when a season ticket holder has major life events come up and cripple their ability to make it to the stadium? How about if they use the team-endorsed reselling platform to part ways with their seats for each game? In the instance of Jim Hayes and his family, what happens is – your tickets get cancelled, and nobody but computers and anonymous staffers even responds to you until the media picks up on it. Hayes, who had purchased Denver Broncos season passes with his wife in 2011 – after languishing on the waiting list since 2004 – published an account of what he feels is gross mistreatment of a longtime customer on LinkedIn earlier this week, an account which has since gathered steam on the social media site and beyond. It’s one of many examples of teams and venues flexing their monopoly muscle without any recourse for the aggrieved, who simply have to live with the unilateral decision to terminate their “revocable license” and pass it on down the line to whomever they like. 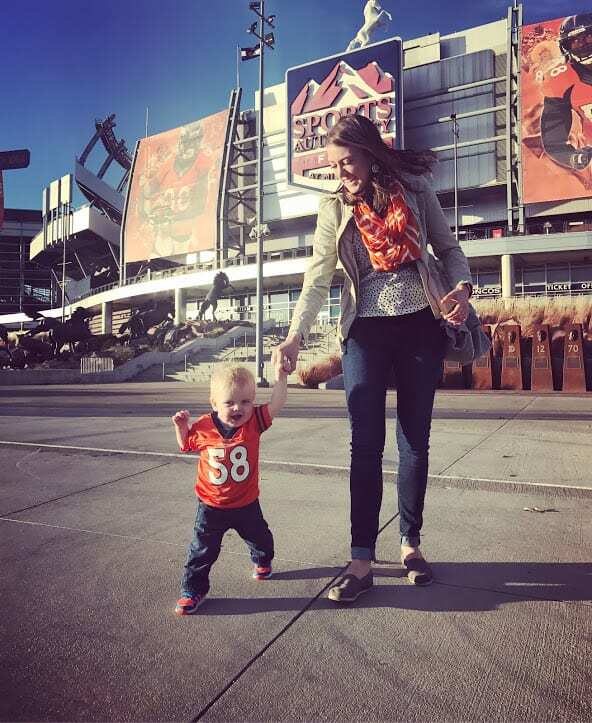 Mrs. Hayes and one of the couple’s children outside Sports Authority Field at Mile High. That gut-punch led to an extended back-and-forth, as Hayes tried to explain the reasons for his family’s inability to attend in person, but they fell on deaf ears – or rather, would have, if any humans had been involved. All of their complaints and requests were sent to an automated system, and answered by an anonymous staffer on the other end. Naturally, this frustrated Hayes, who turned to the internet to vent, and provide his list of grievances, and why they go behind simple anger at the team’s decision. To summarize his points: The Broncos implied that they pulled his tickets to give them to REAL fans (because only “fake” fans have children, if the logic follows). He used the official exchange, authorized by the team and NFL (otherwise he could have been held liable for behavior of those using his seats). Because of that choice, the league knew the seats were re-sold. And finally, they didn’t even have the decency to be personal in their communications. “We would love to get our season tickets back so we can take our sons to Broncos game as they grow up, but given the Bronco’s leadership response we think that is unlikely,” he concludes. “Our focus now is making sure this doesn’t happen to any other loyal season ticket holders in the future. At the time of this post, Hayes’ piece has been viewed by over 30,000 people on LinkedIn, with over 600 likes, 100 comments, and 70 shares. Interestingly, accounts linked the the Denver Broncos organization were among the top to have viewed the story. The negative fan experience certainly struck a chord in the world, which is full of others who have felt similarly mistreated by organizations that treat love and loyalty like a one-way street – expected from fans, but not reciprocated. At its core, it’s true – the organization explicitly states that it has the right to revoke tickets for any reason in its ticketing agreement, just like almost every other venue and performer. At the end of the day, they hold all the cards in the agreement and can give you any reason, or none at all, for not renewing. TicketNews reached out to the Denver Media Relations office, and the organization responded with its reasoning – specifically that his family had not attended a single game in 2016. The Broncos also pointed out that the family did purchase two tickets to postseason contests in 2015, which were both resold. It also made a point of the fact that the organization reviews all resale marketplaces, not just the official exchange, in making such decisions. The ease of making such determinations outside of its preferred marketplace is murky, but it should be said. Finally, the Broncos pointed to their ability in clearing out accounts like Mr. Hayes enabling them to “provide upgraded seats” to other account holders, as well as make season tickets available to others on their waiting list, 144 of whom had been made such offers thus far in the ramp-up to the 2017 campaign. In the end, nobody here really wins, save for whoever gets the Hayes family’s seats going forward. Lets just hope they don’t make the same mistakes as he and his wife did, having to hit the pause button on their ability to go to the games while starting a family. Otherwise they, too, could get some bad news in the mail on a spring day in the future. Pretty surreal that the Broncos decided on an,ill-advised course of action with one criteria – no games attended in 2016 – and then start grasping at straws to demean Mr. Hayes. I mean, how do they KNOW he didn’t,buy the playoff tickets in good faith, then been unable use them without finding a trusted buyer (Broncos threaten to revoke if random buyer causes a problem). If he had called the Broncos with,this dilemma, they would have INSISTED he resell on their NFL Ticket Exchange – or else. What hypocrites – unfortunately those who run the Broncos are starting to ruin Pat Bowlen’s legacy their incompetence. Hopefully his family can realize it and stop these people.